Let’s face it- Helen Mirren is a gift from Baby Jesus. She’s one of the greatest actresses of our time and unlike a certain peer of hers, she doesn’t choose projects that are deemed to be solely designed as pure Oscar bait. Next month she graces the silver screen playing real-life heiress, Sarah Winchester. The movie, according to IMDB, “is inspired by true events. On an isolated stretch of land 50 miles outside of San Francisco sits the most haunted house in the world. Built by Sarah Winchester heiress to the Winchester fortune, it is a house that knows no end. Constructed in an incessant twenty-four hour a day, seven days a week mania for decades, it stands seven stories tall and contains hundreds of rooms. To the outsider, it looks like a monstrous monument to a disturbed woman’s madness. But Sarah is not building for herself, for her niece (Sarah Snook) or for the brilliant Doctor Eric Price (Jason Clarke) whom she has summoned to the house. She is building a prison, an asylum for hundreds of vengeful ghosts, and the most terrifying among them have a score to settle with the Winchester.” The trailer is terrifying and I, for one, am excited that we have a new original horror film getting widescreen distribution and not another reboot or sequel to something who’s last installment came out 10 years ago like the RINGS. 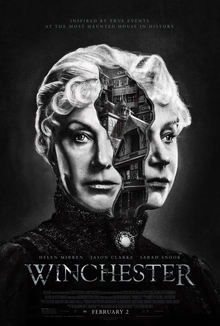 Winchester is expected to hit theaters February 2nd. Previous Hellraiser: Judgement trailer is here!